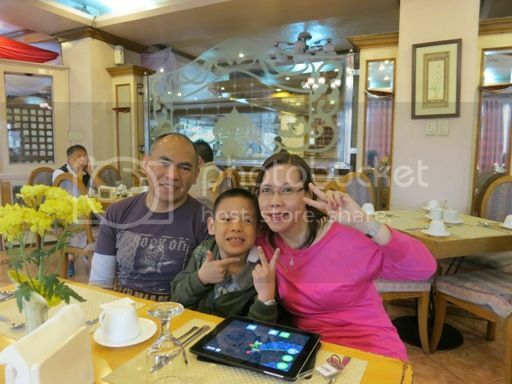 We stayed at Golden Pine Hotel for our 3-day, 2-night vacation in Baguio last February. It’s a 3-star hotel which is walking distance from Burnham Park. Our stay there included complimentary breakfast for three people; there were four of us (three adults and one kid), so we had to pay for our son’s breakfast. Hubby chose American breakfast, while I ordered Filipino breakfast for me and our helper. We were actually looking forward to having breakfast at Golden Pine Hotel because we enjoyed the room-service dinner we had the previous night. This wa hubby’s choice of breakfast. His plate was wiped clean which only meant one thing: he enjoyed his breakfast! I love bangus (milkfish), so this plate’s mine. The bangus was a bit sour than usual, but it was tolerable, and I knew that it was freshly cooked because it was hot and crispy. As you can see, they’re not scrimping on their servings. 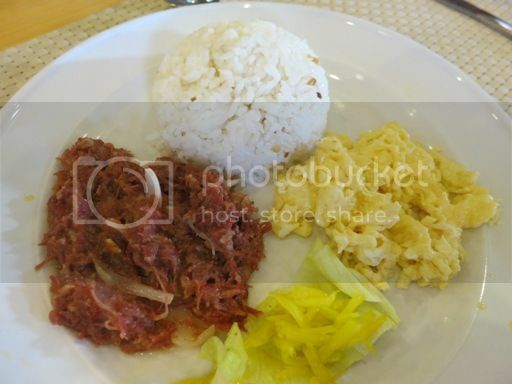 You can even order extra garlic rice for the big portions of corned beef on the plate. This was for our little boy. He ate all the sausages but not all of the pancakes because he said he was already full. 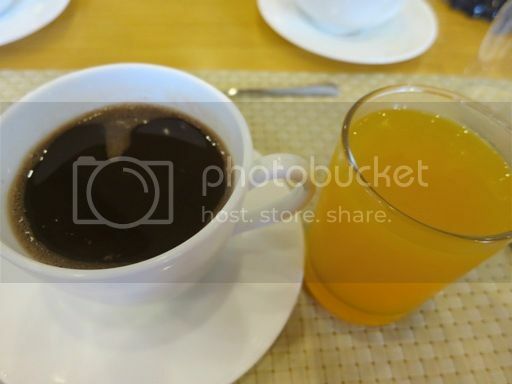 Hot chocolate was perfect for Baguio’s cold weather, but we still had an extra glass of orange juice. 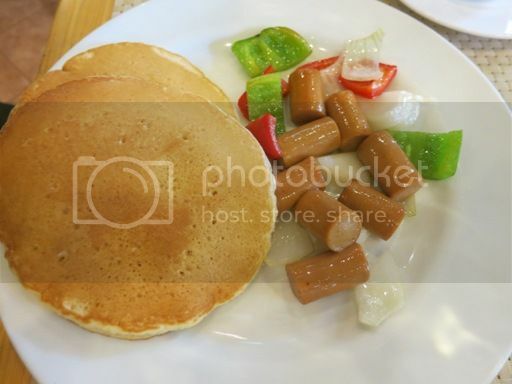 If you’re ordering a la carte, their American breakfast and Filipino breakfast cost Php200.00 per plate, while their pancakes with sausage (or bacon) costs Php130.00. 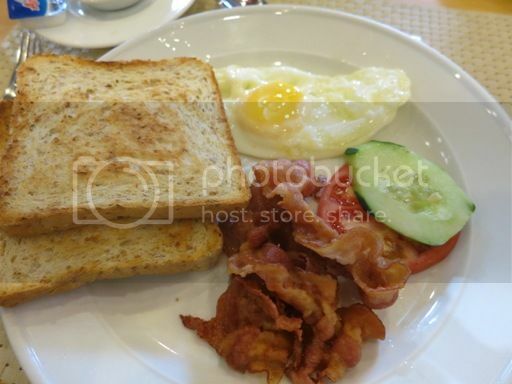 This entry was posted in Baguio, Complimentary Breakfast, Golden Pine Hotel. Bookmark the permalink. 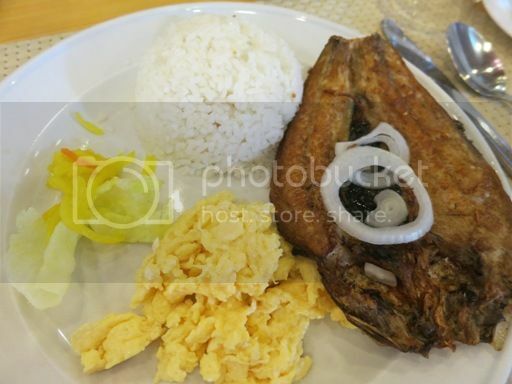 not a very grand breakfast, very filipino but what matter most is that you have a great time with your family. Daing na bangus is one of my favorite. Especially if teamed up with ginayat na mangga with kamatis. Hihi. Been to the Golden Pine last year but we only stayed for the night. Will try their breakfast offerings next time. Oh wow, you family looks very happy and the pictures of your food are quite inviting. You must have had a wonderful time.